Engineers are seriously envious of nature. While the best human minds toil to find the optimum material to serve a purpose, Mother Nature has already found myriad elegant solutions to many problems, thanks to the billions years of evolution she project-managed. The term for innovations that imitate Gaia's all-natural solutions is known as biomimicry. But as artists get their hands on more biotech gadgetry and tools, there's a canon of bioart emerging that we’d like to call media-mimetic biology: that is, living matter that imitates the media forms we’ve come to love over the last century. From Tamagotchis to AM radios, here's how to use nature to your artistic advantage. One of the first instances of media-mimetic bioart was Edgar Lissel’s photosensitive bacteria. It's quite poetic: a microscopic photograph (of a single bacterium) is projected onto an agar plate of bacteria that respond to light. The bacterial colony acts like slow-exposure film, gradually reproducing an image of a lone bacterium. For something similar, see the yeast printed selfies from artistic collective Pavillion 35. 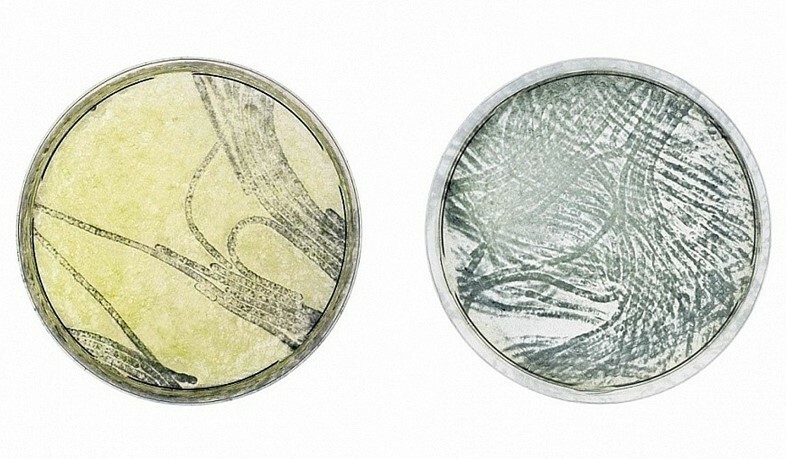 Günter Seyfried's bioartwork is a true intersection of digital and biology. Mapping moving images into GIF data, Seyfried’s team have built a system to read the binary data into DNA, which is then implanted into a bacterial genome. Seyfried subsequently plays God with his GIF-ed up bacteria, cranking up the evolutionary stress on his colonies. He then extracts the DNA and converts it back to a GIF. The result? 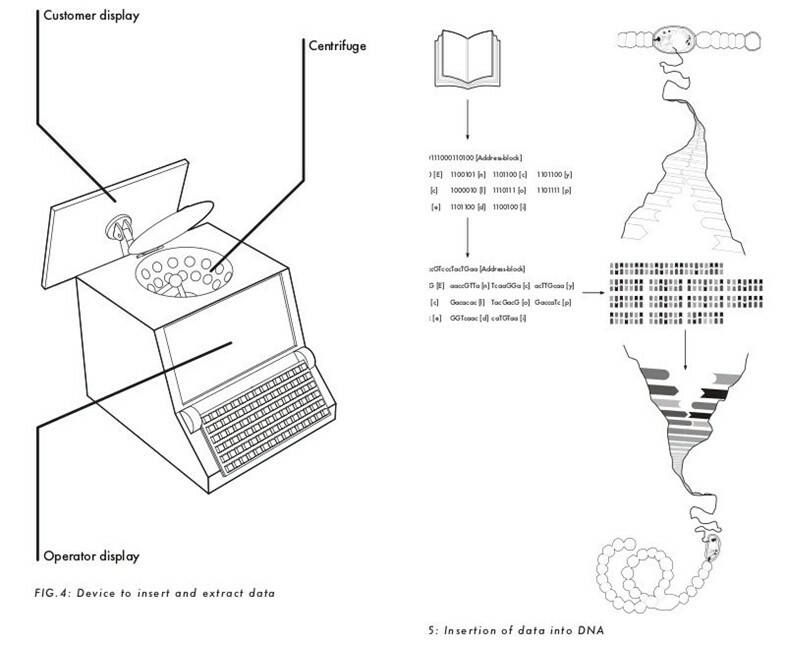 Data-moshed biomedia and an exploratory prototype for bio-cinema. Ants are pretty great collaborators for any bioartist. Artist Loren Kronemyer wrote exhortations in pheremones and then let ants flashmob her words, all captured in mesmerising time-lapse. Bio-cybernetic engineer Kuai Shen Auson went a step further, creating an elaboration technological ecosystem where a colony of ants could act as DJs! Of late we’re all a little agog at the seemingly limitless potential for objects to be 3D-printed into reality. 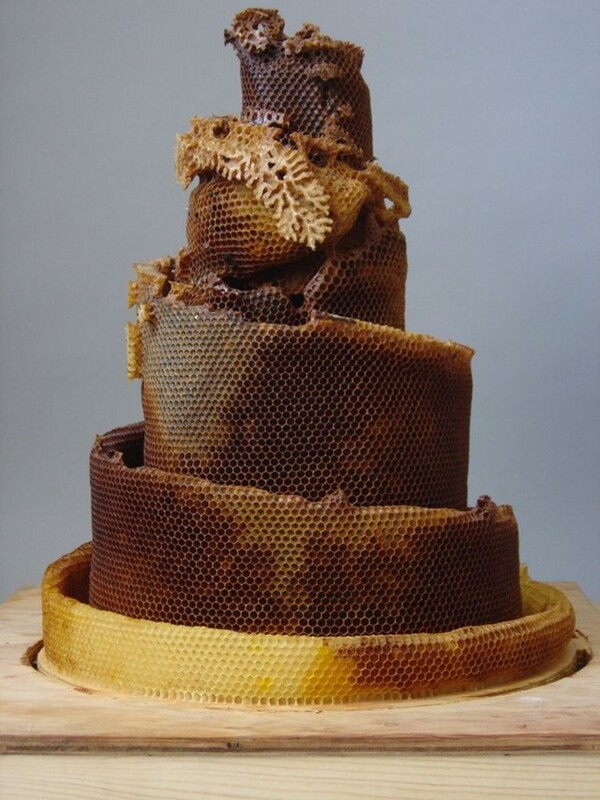 That is old hat for nature and the insect world – for instance, this humongous structure created by ants – but check out this biofabrication from bees! 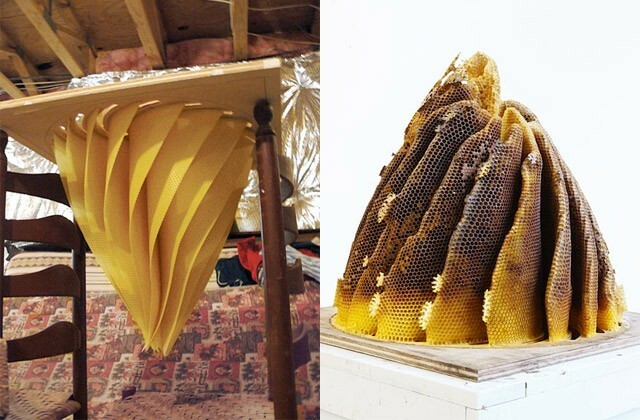 Here artist Hilary Berseth provides the software, producing the "file" while the bees print on top of her scaffold, acting in the same way a 3D printer like the Makerbot does. Synthetic biology is the hot topic in biology these days – it proposes to make circuits out of living things and their inner parts, turning ponds of algae into diesel-generating reservoirs. 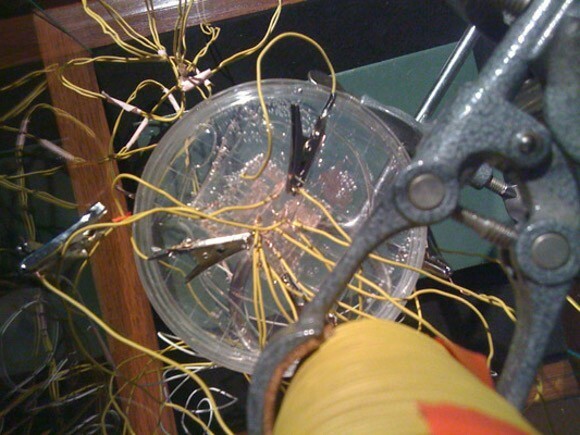 Joe Davis, the Godfather of bioart, inverted this paradigm with his bacteria crystal radio. The genetically altered bacteria coats the circuit with all the metals necessary to produce an AM radio antenna! Many media artists have wed biology to robotics, too many to count (though we can't not mention Gilberto Esparza’s beautiful wandering robots that are powered by symbiotic plants). Most curious of the biobot is the Tardigotchi. Imitating the 90s craze in appearance, the twist here is that there's an actual organism (a tardigrade, AKA water bear) living behind the LCD screen. Cute from afar and monstrous beneath the microscope, tardigrades are seriously nonplussed by even the most hostile living conditions. They can even survive the vacuum of space, leading some to hypothesise that they are aliens living among us! Stem cells are potentially miraculous. Reverse engineer a cell through molecular manipulation and you can return it to a ‘year zero’ point, whereupon you can coax it into becoming any type cell permissable: you can, quite literally, grow a new patch of skin. No wonder Verena Friedrich decided that stem cells would make perfect participants for a commentary on the advertising rhetoric of the cosmeceutical industries. "Have you ever wanted to strum a protein quantum mechanically and hear its response?" That was the hook of Josiah Zayner’s and Francisco Trigueros Chromocord, an instrument that made music out of plant proteins. All of us, every single living thing, is composed of proteins: our cells make them when they interpret the instructions contained in DNA. 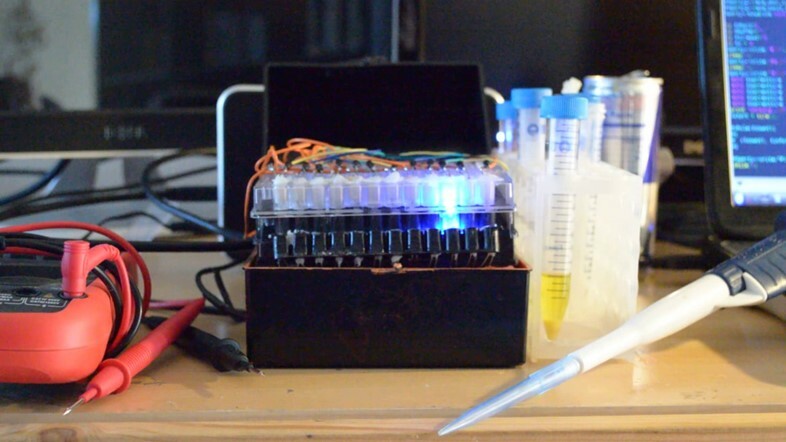 This project is a measure of the mastery being obtained over this most crucial domain: using the arduino platform, it's possible to build a device that can interpret protein reactions like a keyboard reads MIDI notes! The humble computer: the media format that's eaten every media technology that preceded it. We've mentioned biological computers before (shoutout to the petri dishes of brain cells that have respectively flown planes and managed electricity grids) – but beyond brains in a dish, there are serious efforts to understand how one might build a better computer using bits of biology instead of bytes of data. Slime moulds are of persistent interest in this area. Andy Adametzky of Bristol University even wrote a book on how you could build computers from them. Honorable mention to the creepy avatar above, whose emotions are dictated by a colony of yellow slime mould. Picking up on the potential for DNA to be the ultimate data storage medium, technologist Phillip Ronnenberg proposes building a darknet like TOR from sewer algae! Part of his imaginative Post-Cyberwar Series, such a scenario isn’t that far-fetched, provided the interest in DIY bio keeps up momentum.